Congratulations to Debbie Merhege of Bludawg Designs! She's the winner of a beautiful collection torch-fired enamel beads. Debbie, you'll need to contact Barbara Lewis. And just in case you missed it, I was stop number five of Barbara's Virtual Book Tour - a fun way of spreading the word on her new book, Torch-Fired Enamel Jewelry. It was a total blast and I thank all of the visitors and new friends! Here's the list to follow along. Today's stop is Diane Cook over at Rosa-Josies. FYI, her interpretation is stunning! Just sayin'. What is the one small thing that always makes you happy? When I get a new magazine in the mail. This is all it takes to make it a "red letter day". Like you, getting a magazine in the mail is so exciting to me. I subscribe to quite a few, and it never gets old to see one in my mailbox. Chocolate shakes are a close second on the list. 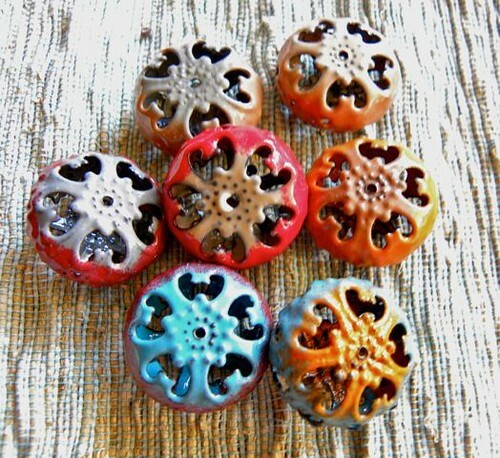 Lori, I'm so excited to be picked as the winner of your gorgeous enameled beads! Thank you so much! A piece of chocolate every day! My Starbucks latte in the morning. Finding one stray chocolate chip. And there is always one stray rolling around in the apple bin in my refrigerator (isn't that where everyone keeps their chocolate chips once they are open?). Usually I want to bake some (so rare, I know!) with them, but that one stray chocolate chip, despite having to dust it off is quite tasty. I will do anything for a chocolate chip snack! I guess I'm too late for your giveaway. Didn't realize I was supposed to be leaving a comment on all the blogs I've been reading. But I loved your review. I love it when I get a new wire magazine. And especially when I get a phone call from one of my boys.